Whether you are spending time with your family or braving the elements to finish a job, the team at JLG wishes you a happy and safe holiday season. 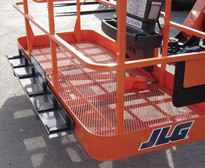 Receiving the message “Running at cut back in material hook mode” on a JLG Towable Boom model indicates that the machine does not recognize the presence of the upper control box. When this happens, the unit assumes that the basket has been replaced with a material hook. If the upper control box is present on the machine and this message still appears, contact the JLG service department for assistance. This short video explains how to properly detach the platform and upper control box and install the material hook for T350/T500 model booms. As part of our accessories offering, SkyGlazier© platform Glazier kits contain a factory approved glass and panel tray that holds materials, reducing operator fatigue while protecting panels from damage. Here is a look back on some of our favorite Ground Support installments in 2013. Catch up on the stories that you missed and refresh yourself on some key tips for servicing and operating your JLG® machines. 1. Cold Weather Tips (January 2013). Another winter is upon us; use our tips for maintaining your JLG machines to keep your fleet operating smoothly. 2. Ultra Boom Jib Swing Video (March 2013). This video explains how to stow the jib on the 1500SJ, a great supplement to your operations training. 3. Dwight Gates Receives Department of Defense Patriot Award (April 2013). Dwight Gates, a JLG supervisor in Bedford, PA, received this prestigious award for supporting guardsmen and reservist employees. 4. JLG® Mobile Analyzer (May 2013). This unique diagnostic tool allows technicians to evaluate equipment performance from up to 150 ft away through integration with a mobile app. 5. Compact Crawler Remote Control Display Video (October 2013). To improve workplace efficiency, the remote control display on Compact Crawler boom lifts can be used to show machine status in real time. Instructor Led - Traditional classroom instruction where the instructor and participants are in the same location. E-Learning – Instruction is delivered electronically without an instructor and is usually self-paced. Online – Instruction is delivered electronically but facilitated by an online instructor. The instructor and participants are not in the same location. Online training is usually scheduled with the pace set by the instructor. All 2013 classes are full, and 2014 classes are filling up! Download the 2014 Training Schedule (171 KB) or check out our online courses. Our Parts and Services call centers will be open and shipping priority air and international orders on Tuesday, Dec. 24 and Monday, Dec. 31, from 8:00am EST to 12:00 pm EST. Both call centers will be closed Wednesday, Dec. 25 and Wednesday, Jan. 1. 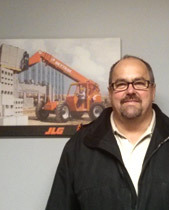 Last month, Dwayne Culp of Valley Supply Equipment won the trivia challenge and the bragging rights to go with it. Congratulations, Dwayne! As the year comes to an end and holiday festivities seep into the workplace with gift exchanges and games, inject a bit of job-relevant fun with JLG® Trivia. For added entertainment, put a prize on the line—like an extra gift from under the company tree—to increase engagement and to help your coworkers learn something new in the process.